Discussion in 'Designers and Collections' started by dodencebt, Oct 28, 2015. I enjoy him speaking so much! sweetcaress, fashionista-ta and Nymphaea like this. He's funny in the video, Miss him so much. When will he come back ? ^ An excerpt from the above talk at Parsons, or something new? Check the new hair color! Au naturel? I dunno, he looks like a bottle blonde to me, lol. It's odd. My sentiments about Alber have shifted from 'ugh, where will he be installed' to 'this is it, he's living his life and actually look great while doing so.' It's his sense of agency that's so impressive. Yeah, it's a little too champagne to be completely natural, I guess, but I'm thinking he's probably gone white or grey, and had been coloring it brown? I think in the beginning he literally wasn't capable of going anywhere else. With the settlement, he doesn't need to work again. I would be interested to know if he's making clothes for any of his favorite people. I haven't seen anything attributed to him on the red carpet, but it could be more subtle than that. He may well still be recovering. Elbaz is the next designer to take part in the Italian brand’s Tod’s Factory project, which consists of capsule collections released throughout the year in a bid to keep pace with a fast-moving fashion market, reverse falling sales and rejuvenate the Tod’s brand. 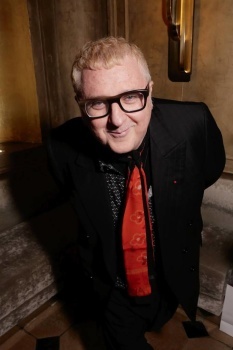 Alber Elbaz is teaming up with Tod’s as part of the Italian luxury brand’s Factory project, said Tod's Group president and majority shareholder Diego Della Valle, at a lunch yesterday. The initiative, named after the New York art studio opened by Andy Warhol in the 1960s, consists of capsule collections created with leading designers and released throughout the year in a bid to keep pace with a fast-moving fashion market that is hungry for newness, reverse falling sales and rejuvenate the Tod’s brand. Elbaz’s collection for Tod’s will be unveiled later this spring, though little else is known about the partnership. The designer has been inactive since he exited Lanvin in 2015 after turning the once-dusty label into a star brand globally known for its impeccably chic cocktail dresses. “Once, I had to present products to the press, hope they would write about it and that customers would rush to the shop after reading. Now I can target customers directly, matching product and communication,” said Della Valle. The strategy is reminiscent of fellow Italian brand Moncler's Instagram-friendly Genius project. Built around a series of high-profile designer collaborations, the strategy boosted awareness and traffic, both online and off, for the luxury outwear brand in 2018, said Moncler president, chief executive and primary shareholder Remo Ruffini. The Tod’s Factory project launched in the autumn with a capsule collection designed by industry veteran Alessandro Dell'Acqua and will include a 14,000-square-foot Tod’s Factory store on Milan's Via Montenapoleone, which Della Valle described as “shops within a shop." Tod’s, which is best known for its Gommino shoes and leather accessories, is in the midst of a challenging turnaround that has yet to bear fruit after five straight years of declining sales. In March, the company reported a 26 percent drop in 2018 profit, with full-year earnings before interest, taxes, depreciation and amortization (EBITDA) falling to €118.3 million, hit by a sharp increase in spending on marketing and design. mathiaskatz and fashionista-ta like this. I have zero clue what this could look like, but I'm happy to see him back, even if it is only minimally. And if it's anything like the Moncler Genius line, which is fantastic IMO, then more power to him. Feeling..hopeful. Lanvin just needs to repent and hire him back. He's too good for f-ing Tod's. forget it. he wasn't very sensible at Lanvin. So they're not gonna hire him again never ever, that's a fact. ^ Please. You cannot be looking at him and Madame Wang and saying he's the one who wasn't sensible. But the Lanvin ship has sailed. I dunno, maybe some future miracle is possible, but at this point I think the most graceful move is to shutter it and put up something nice in marble with the dates. I was so sure he was going to take over for Karl at Chanel. When Hedi got the job at Celine and then Karl died I was certain it was going to be Alber. Oh well. It's nice to see Alber put his design muscles to use for Tod's. They need the help. It'll be curious to see how his work has changed/updated, if at all. He was pretty consistent with is signature and style all the way from YSL through Lanvin. It's curious because fashion has changed so much in the time he's been gone. I'm not quite at the point where I'm dying to see what he would do if he were back in full gear. Waiting to see how Patou and Chanel play out this upcoming fashion month to get a fresh read on the pulse of things. As others mentioned, money is not an issue so I think he'd only come back to a steady gig if the passion was there. Perhaps he's merely waiting for the right job to come along. It seems he can afford to so why shouldn't he? It’s funny we all had those speculations about Chanel when in fact Karl already knew and groomed his successor. It’s so unusual in our times. Alber is friendly with Delphine Arnault and the Arnault in general . I think that he could totally work for another big brand. As you said, he has always been consistent in his work...From Guy Laroche to YSL, Krizia and Lanvin. But I don’t think that revamp a struggling house is something he should do. The next stage for him is really to be integrated in a very well organized and oiled machine....Dior, obviously.